Very often, when making a part on the milling machine, this part might be difficult to hold. One way round this is that many parts only only a small part of the system being made. In this case it is quite possible that some other part of the system can be used to hold the workpiece. This is true because the part invariably has to fit some other part and it might be that this other part can be held more easily. In the example shown below a round bar has to be machined to provide two flat faces at particular angles. 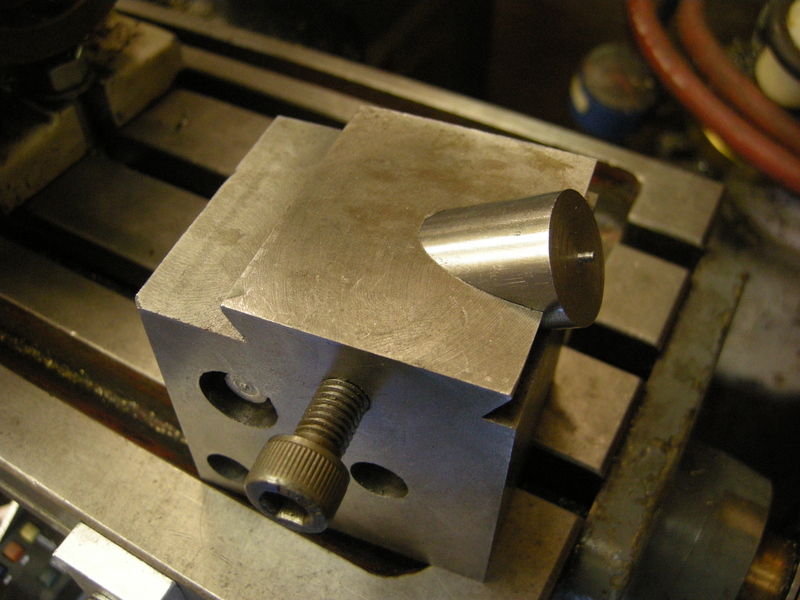 Holding any round part usually requires some other tooling and that has to be aligned appropriately. In this case the round part happens to fit an existing hole in a part that is roughly rectangular and easy to hold. The overall system being made is a quickchange toolpost. The round part is the part that grips the toolholder in the toolpost. The only modification made is a bolt in the toolpost to hold the round part in place.